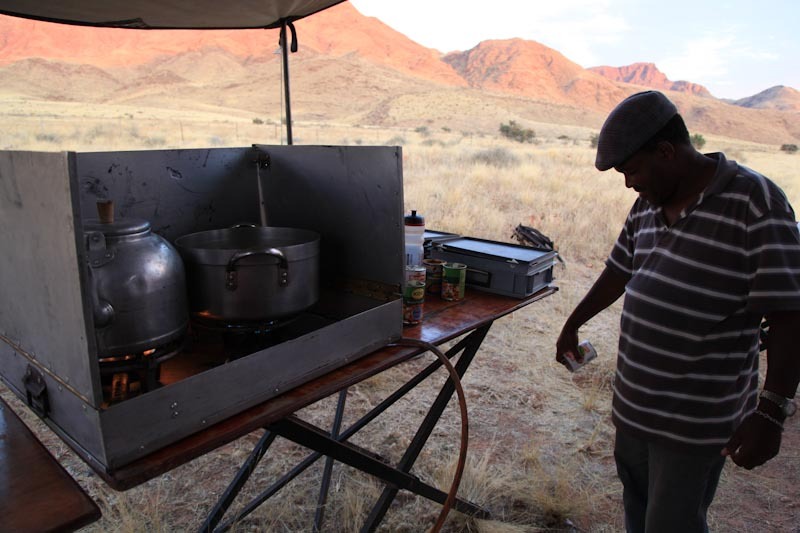 This blog is to pay homage to the man that has fed us for the last 6 weeks, morning noon and night he has cooked up some unbelievable meals, in some of the most remote locations with the most minimal set up one could ever think to cook his dishes with! I call him Prince, Prince Charles. He rocks the flat cap! I have included a few photo’s of Charles at work and what he works with, but without a doubt he food is amazing and I can only imagine what he could do in a real kitchen, If Bobby Flay was to come and showdown with Charles he would lose and if Gordon Ramsey tried to get feisty with him not doubt Charles would be the man left standing. One of the most endearing things about Charles is his passion and professionalism and at times his fatherliness. He allowed us all to enter his kitchen and get involved in cooking, I think everyone has learnt a trick or two and come to appreciate Cookers and Ovens!! I have decided to honour Charles with a top 5 of his dishes, unfortunately I did not get photographs of them all, but I have given my top 5 in reverse order with a brief description of how he cooked them! 4. Sausage Casserole – Now Charles is a sausage specialist he waited to cook this beauty until he got to Zimbabwe, the reason? 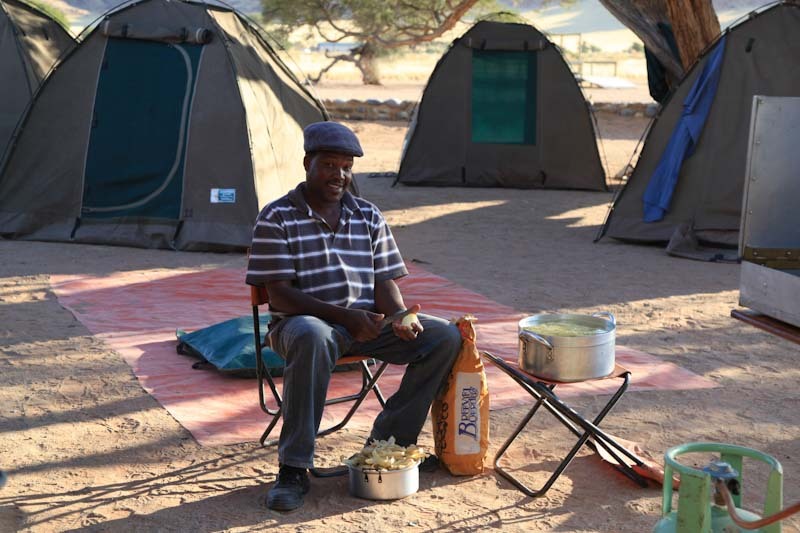 The quality and the saltiness was not good enough in other countries, he even had me test and taste sausages in Namibia to see if they were suitable for his dish…they were not! 3. 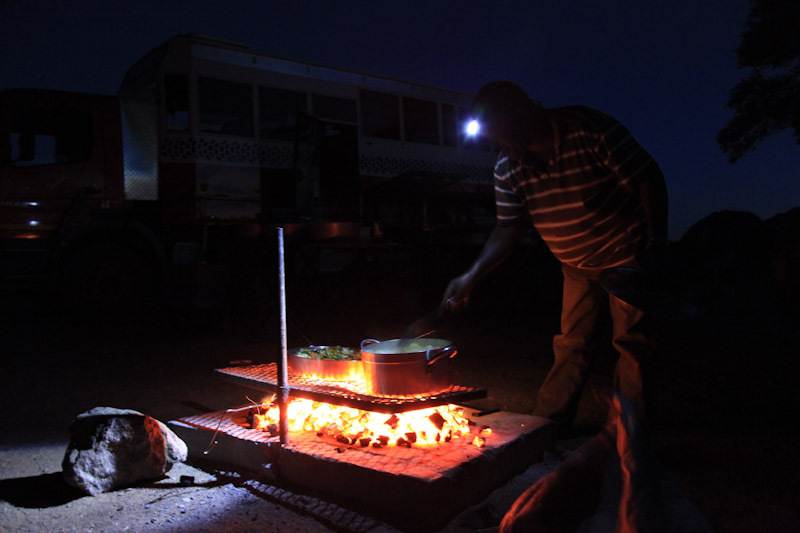 Beef Curry – Sat in the middle of the Serengeti in our bush camp, it was the evening after our hot air ballooning, after a fantastic day Charles served up Beef Curry, now it’s not the norm to have beef in Indian food, but my word this curry rocked! 2. Beef Stir Fry – Now again think about being in a little campsite, its been raining all day and we are in the foothills of Mount Kilimanjaro, Charles cooking for 20 dishes up a Beef Stir Fry, Simply fantastic, it was not the only time for stir fry as we also had Chicken stir fry at a later date that was equally as worthy of its 2nd place ranking! 1. Lasagna – Now lasagna is one of my favourite dishes, so I consider myself and master on this particular dish, I have even had friends competing over me with there versions of a great Lasagna! This was for me the best dish Charles made. IN addition to put this dish in perspective it was ‘baked’ on a BBQ!! How you ask!? Well charles places pan on a griddle just above the coals, then places a metal tray across the top of it, then places more hot coals ontop of the pan thus created a BBQ Oven!! Simply amazing! Now this list took some internal wrangling but was the final but some highlights that were missed were his multiple T-Bone steaks, BBQ Pork Chops, Bacon sandwiches and most important the Back bacon he found for me in Zimbabwe and Namibia, Fried Chicken in the middle of the Serengeti and even a Shepherds Pie. The Man, The Legend, ‘Prince’ Charles, He Also had a great sense of humour…..